HIGHEST EFFICIENCY AND MAXIMUM VARIABILITY. 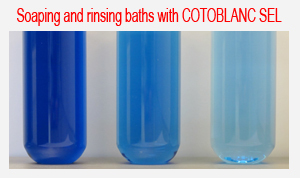 Less is more with innovative VARIO SOAPING: COTOBLANC SEL reduces the number of rinsing baths to a minimum in aftersoaping of reactive dyeing. An optimal soaping result is obtained with only 3 rinsing and soaping baths independent of the hardness degree and the salt content. In addition the rinsing and soaping temperature can be reduced to 40 °C (depending on the applied reactive system). Soaping of reactive dyeing at temperatures of 40 to 98 °C depending on the applied reactive dye. Ideal process optimisation is obtainable in combination with VARIO BLEACH 3E (bleaching at 70 °C), BEZAKTIV GO (dyeing at 40 °C) and VARIO SOAPING with COTOBLANC SEL (rinsing and soaping at 40°C).